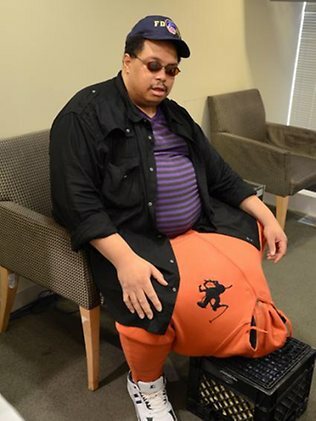 A LAS Vegas man with a medical condition that has caused his scrotum to swell to more than 45kg is trying to raise $US1 million for surgery to correct it. Wesley Warren Jr, went public about his condition – scrotal elephantiasis – because he is desperate to try and raise the cash for the costly operation. Mr Warren’s scrotum is so large that he has trouble walking and using the bathroom. The 47-year-old, who developed the rare condition three years ago, said he has regular bouts of depression. Although he knew some people would laugh at his condition, Mr Warren decided to go on Howard Stern’s radio and cable TV show to raise awareness of his plight. His condition is rarely seen outside of the tropical areas of Africa and Asia and is usually caused by a mosquito-spread parasitic infection. But Mr Warren said he had never travelled to tropical areas and believes the condition is down to an accident in 2008, when he caught his testicles with his leg while twisting in bed. The next day Mr Warren said his scrotum had grown to “the size of a soccer ball” and continued growing. He should change his name to Jose Mendoza. Then he would get the operation for free! Wow! Calling that a huge scrotum is an understatement… I’ve heard of testicular trauma before, but, uh, holy ball sac! That scrotal elephantiasis is some serious stuff. I hope that man gets some money for his million dollar surgery – and fast – because that is just plain freaky! Yikes!